Outdoors - You Should Visit Japan! Japan is for nature lovers! When Japan is mentioned, many people first think of the huge metropolis of Tokyo. And while there is a LOT to see and do just in Tokyo, there is also a very different Japan to experience outside of it. Whether you want to take in the famous Japanese gardens, do a bit of camping around stunning Lake Shikotsu on Hokkaido, hike Mt. Fuji, or play with the bunny rabbits on Okunoshima, you can fill many vacations in Japan with the great outdoors. The Official Web Site for Mt. Fuji Climbing. A comprehensive travel guide to climbing Fuji-san on Wikitravel. Fujiyoshida City's travel guide. Includes reservations for huts along the climbing trails. Japan-guide's page, which includes bus routes to the 5th stations. Map and guide forecasting Sakura (cherry blossom) blooming across Japan. 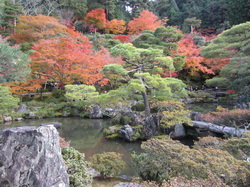 Map and guide forecasting the fall colors across Japan. How about camping gear made in Japan? Like the ONLY sleeping bag on the market with a built-in mosquito net, tents that pack up super small, cooking and heating items, clothing you can wear all year round, and more cool stuff. Innovation and quality the Japanese are famous for, with sales in service in the U.S., only at Breezy Brigade.